The second in an amazing series!! If you enjoyed the first...you will enjoy the second even more! Emmeline...took the dare and feel in love. Nick...gave her a wedding night and walked away. Nine years later...they are reunited and Nick has a lot to make up for. He crushed her soul, along with his own, and now needs to rebuild what they had but lost. This is truly a love at first sight story with hilarious witty banter between Emmeline and Nick and gives you a taste of other emotions along the way. A very powerful and enjoyable read!! Go ahead and read it...I dare you! I would give more than 5 * ... but got to stick with the provided rating plan. If you love the first, you’ll love the second! Another amazing story, in what is fast becoming one of my favourite series ever. After just one night in Vegas, Emmy knows her life will never be the same. Meeting Nick, falling in love and getting married, then being left alone after their wedding night, leaves Emmy devastated. Nine years on, she needs a change from the hustle and bustle of city life, so she temporarily leaves her fiancé behind and embarks on a new life as a kindergarten teacher in small town Jamison Valley. At her first social outing, the Cleary’s Halloween party, Emmy is shocked to run into the husband who abandoned her in Vegas 9 years earlier. Nick Slater, can’t believe his luck when Emmy walks back into his life, seeing it as his second chance at what he knew was his one chance at love. Emmy has other ideas though, when Nick wants another chance, Emmy wants her divorce papers signed. The pair reach an agreement and begin spending time together, and once her fiancé turns up to spend time with her, she realises her heart is once again, Nicks. As with all things in life, it is not smooth sailing and a misunderstanding and an attempted kidnapping almost tear the pair apart, but their love for one another makes them fight that much harder to get their HEA Another fantastic story by the wonderful Devney Perry, the growth in this series is remarkable, her writing and talent for storytelling astounds me each and every time. 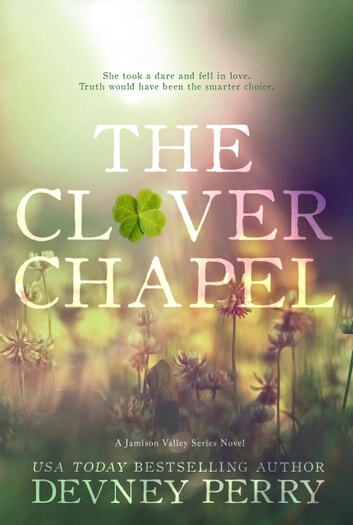 I fell in love with the fabulous fictional town of Prescott, Montana in The Coppersmith Farmhouse and couldn’t be happier to take another trip there in The Clover Chapel. Devney Perry has a talent for delivering top favorite stories that bring a perfect balance of sweet romance and suspense. I look forward to many more books from this fantastic author. Loved Nick and Emmy! They get married in Vegas and when Emmy wakes up Nick is gone. Fast forward nine years and Nick is the fire chief and Emmy moves to Prescott to be the new kindergarten teacher. Mystery and suspense is found in spades in this second chance at love novel! Devney Perry is my new auto buy! Love this series!